Published by the American Bar Association (ABA), Reinventing the Practice of Law explores ways in which lawyers can change their practices to make things better – for themselves, their clients and their neighborhoods. We all want to make things better. We want to improve our law practices. We want to improve the legal profession. We want to improve our communities. This book encourages lawyers to step out of the mold and consider how they can create better practices when providing personal legal services. 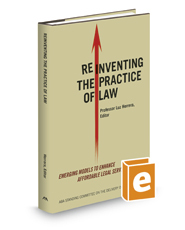 It offers a useful compendium of essays from nationally known lawyers describing how they have begun to make our legal system more accessible to moderate income clients. These distinquished authors address the practical, ethical, and business dimensions of new ways of providing legal advice and assistance. This volume is chock full of practical advice for law firms seeking to chart a new course in the practice of law. Beyond the micro changes that individual practitioners can embrace, Reinventing the Practice of Law also details the benefits that result from changes at the community level. It examines the success of a project that creates a community-based network of lawyers and provides the tools and resources to support recently admitted lawyers dedicated to practices advancing social justice. It then concludes with an analysis of nonprofit co-pay law firms scattered around the country. While readable by nonlawyers, great benefit can be had by lawyers who read this book and delve into its exploration of new ideas. Experimentation and reinvention may not have be the hallmark of the legal profession's to date, but it must be a part of our future. The book is essential reading for solo and small firm lawyers, for those concerned with preparing tomorrow's lawyers for sustainable and satisfying careers, and law firms that help everyday people deal with the legal problems of everyday life.